The mission of LEFC is to make disciples of Jesus Christ. We do this by sharing Christ in our relational worlds and pouring into the lives of others. We seek to be people who LOVE GOD, LOVE PEOPLE, LIVE TRUTH and PROCLAIM JESUS. Click here to read our Statement of Faith. When you walk through the doors of LEFC, you’ll notice a casual atmosphere where many smiling faces will greet you. Our Welcome Desk is just inside the main entrance where you may sign a guest register and receive help in finding our KidMin area for your children or our gathering space for Seventh through Twelfth graders. Perhaps most importantly, we have a gift bag with various goodies, including home made cookies …. just for you! A WARM GREETING - Many greeters are on hand to welcome you and to help you find your way. HOT COFFEE - Help yourself to a complimentary cup of fresh roasted hot coffee or tea in our café area. 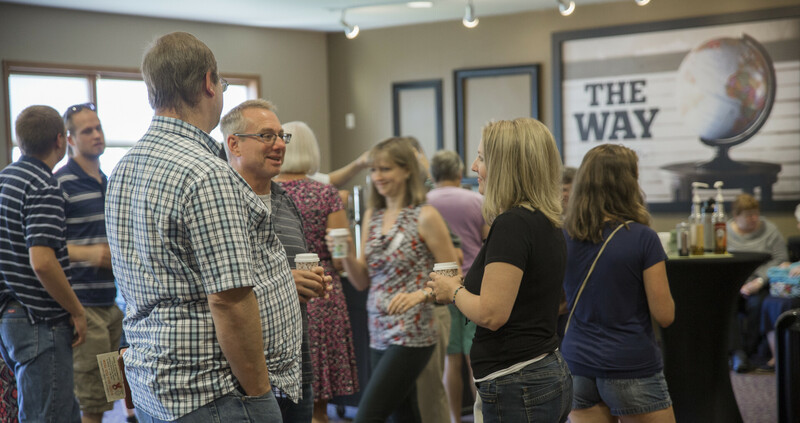 CONVERSATION - We genuinely love each other, and there is an excitement in the air as folks connect on Sunday mornings. Our space is filled with lots of conversation and laughter. WORSHIP - On Sunday mornings we gather to worship through music, prayer and the teaching of the Word of God. Our music is a cross section of worship songs and classic hymns led in a contemporary style with the goal of magnifying the name of Jesus above all other names. Our desire is to see the generations come together as family to worship God in Spirit and in Truth with one heart and voice. TRUTH - At LEFC we hold to the scriptures as the inspired Word of God and use them as our foundation for all teaching. We encourage you to read the scriptures to check for yourself if what we teach lines up with the truth of God’s Word. Whether you're completely new to church or just haven't been to church for awhile, we'd love to see you. You can learn more by attending Starting Point. Starting Point is the primary on-ramp to life at LEFC. You’ll meet other people, learn about our values and find opportunities to connect and serve. Starting Point is a three-week class offered on Sunday mornings multiple times each year.